Two-time Olympic freestyle skier Katie Summerhayes is one of the most accomplished athletes in the sport. An adrenaline-fuelled event that sees competitors tackle a variety of obstacles, including jumps and rails. She has competed at the Winter Olympics and won two medals at FIS World Cup and one medal at FIS World Championships. In 2012 she had the honour of being the flag carrier at the Winter Youth Olympics, but her biggest successes were still yet to come. The Sheffield-born star learned to ski at the city’s now closed Ski Village. She mastered the half pipe and freestyle area early on and later trained with the similarly legendary British skier, James “Woodsy” Woods. 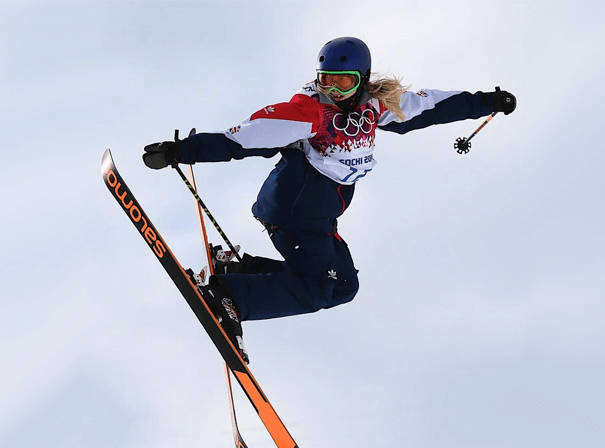 In 2013, Katie became the first British female skier to win a World Cup medal event for 19 years after she came second in the slopestyle competition in Silvaplana. Just a year later came the Sochi Winter Olympics and after qualifying third, Katie placed in 7th in the slopestyle final. She then went on to win a gold medal in the 2014 Junior World Championships in Italy, and achieved the honour of becoming the first ever British female to win a medal in a World Championship freestyle skiing event when she placed in second and took home a silver medal at the Freestyle Ski and Snowboarding World Championships. Katie Summerhayes has overcome numerous injuries to reach her eventual success and is a truly inspirational figure in the world of sport.